The Health Department in HCM City has added motorbikes to the ambulance fleet in District 2 to deal with congestion on January 30. District 2 Hospital is the second health facility that has been used in the motorcycle ambulance pilot programme, after Saigon General Hospital. The satellite emergency station at Saigon General Hospital is located in the city's busy centre characterised by many small alleyways. The motorcycle ambulance has proved to be effective for medics to come to patients as quickly as possible, especially during rush hours. It is hoped that the satellite emergency station at District 2 Hospital will provide the same results as there are many congestion spots with huge trucks nearby. Those are also accident-prone locations. Dr Tran Van Khanh, director of District 2 Hospital, said, "It's time-consuming for regular ambulances to get through the traffic. When it finally arrives, the patients may have already been transferred to the hospital by another type of vehicles that can worsen their injuries." Motorcycle ambulance will help medics arrive and provide first-aids quickly while ambulance trucks are still on the way. Tang Chi Thuong, deputy head of the Department of Health, said, "Using different ambulance will improve patient survival chances. 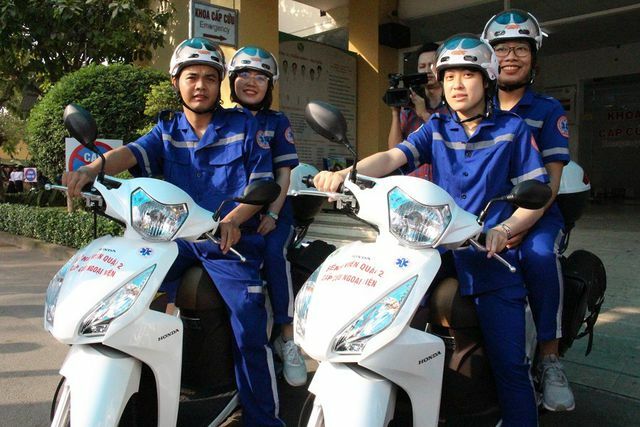 Other hospitals in HCM City will also be equipped with motorcycle ambulances in the coming time."